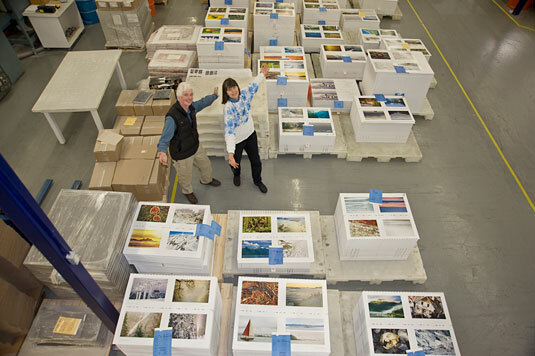 The printing of LABYRINTH SUBLIME: THE INSIDE PASSAGE is almost complete. The imagery printed thus far is absolutely gorgeous, brilliant, ever so colourful, and accurate. To reach this uncompromising quality, more paper was consumed than anticipated. As such, we eagerly await a resupply. Whether additional sheets are available, in our custom size and grain orientation, is yet to be determined. Our guess is that much larger sheets, presumably in stock at the mill, will be cut down to size for us. Although extra costs and wastage is inherent, this option would be preferable to waiting 6 to 8 weeks for another custom mill run of the small quantity now required. There are just two sheets still to be printed, both with four pages on the front and four on the reverse. While we await the continuation of printing, we have taken the opportunity to catch up on rest as well as correspondence and to socialize with Friesens staff. Last evening we enjoyed great conversation and a traditional Mennonite meal — vareniki (a home-made cottage cheese dumpling) served with a cream/fried onion sauce topped with sweetened rhubarb sauce and applesauce, and garnished with a sprinkling of (intentionally) burnt onions. This was accompanied by home-made sausages followed by a pudding made from stewing six different dried fruits. All was delicious and authentic! We’ll also now have a chance to do a little photography nearby. On the prairie, trees such as the Manitoba maple, have been planted as windbreaks around homes and barns. While most days are bright, sunny, and icy cold, other days the sky is as white as the snow-covered fields. 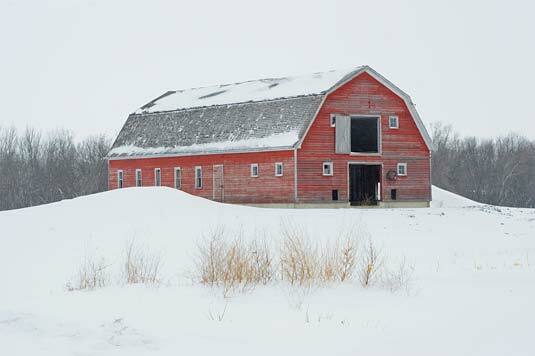 This barn, with faded, red planking, and the yellowish foreground twigs, enliven an otherwise monochromatic landscape on what could be viewed as a dull day. Indoors, back at Friesens, here’s a photo of bright, red paint. 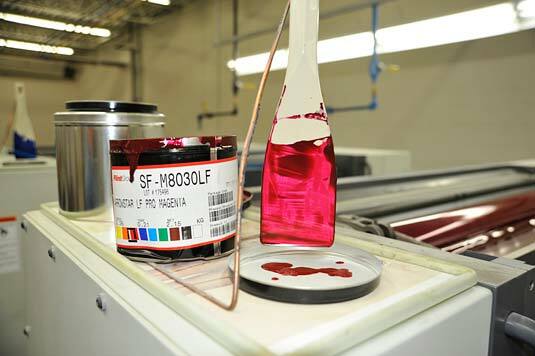 Actually, this is our lightfast magenta printing ink which is poured from these cans directly into the corresponding ink fountain on the press. 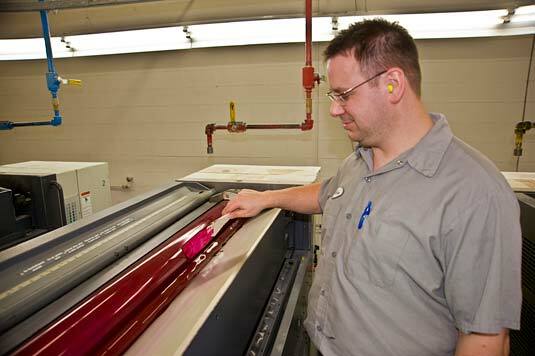 Nathan Bolduc spreads the ink evenly using a spatula as shown below. We’ve been most fortunate to work with head pressmen Nathan, Vern, Glenn, Gerald and Wade on different shifts. Three of these men each have three decades of experience at Friesens! There is much pride among the employees of every department, being that they are also the owners of their company. Pete kindly rose to the occasion using a Sky Jack (a telescopic platform, normally used for reaching burned-out ceiling lights), to photographed us amid the majority of the finished printed sheets of LABYRINTH SUBLIME. We’re ever so pleased with these sheets! Today a quantity of our project’s waste sheets were cut in two lengthwise, and trimmed. These were run through a folding machine. Originating as flats 36" wide by 14" high printed with two pages on the front and two on the reverse, our heavy paper was scored and then folded once, becoming a four-page section 18" wide x 14" high. Everything must be exact; hence these tests are being done. Folded samples are being couriered to Felton Bookbinding in Ontario. Felton is the skilled bindery that also hand-bound ANTARCTICA. Keith Felton will be hand-sewing these preliminary waste-sections into a book-block with which to conduct a battery of tests pertinent to the bindery. The first of his tests relates to the strength of the adhesion of the book block to the hollow. The hollow is a tube, the length and width of the book spine, made of several plies of laminated bindery paper. We’ll explain the binding in detail once we start that phase in the making of the new tome!